Average raw earnings for female university graduates are much less than men who study the same subjects, a study by the Institute for Fiscal Studies (IFS) shows . The economic think tank found that the London School of Economics (LSE) was the only university in the UK where more than 10% of female graduates went on to earn a salary above 100,000 pounds ($142,000) 10 years after graduating. But more than 10% of male graduates from three universities — LSE, Oxford, and Cambridge — earned more than that figure in the same period. The academic gender pay gap was prevalent further down the university league table, too. "Even if we do not focus on the very top, a large number of institutions (36 for men and 10 for women) had 10% of their graduates earning more than £60,000 a year ten years on," an IFS statement said. Along with highlighting the gap between male and female grads, the report also shows the median raw earnings by subject for female students who graduated between 1999 and 2005. While the numbers may seem low, they take into account women who may not have gone into a profession directly related to the subject they studied. Sadly, for women and men, a career in arts doesn't pay very much unless you're at the very top, like Tracey Emin. Communications still seems to be a man's world, but there are exceptions, like Denise Morrison, who was the CEO of Frontier Communications before becoming the boss of the Campbell Soup Co.
Another important profession with surprisingly low pay, it's hard to name many famous architects these days, but Zaha Hadid — who died in March — was one of them. A profession in which women and men's pay is relatively equal, agriculture is an increasingly tough degree to put into practice in the UK. But farming can still be a lucrative career if you can manage to run your own business. Social sciences like anthropology are getting taken more seriously by students and academics alike, but the pay — particularly female pay — hasn't really caught up yet. There's no getting around it: With a pay gap like that, engineering has a gender problem — particularly in the UK, which has the lowest female proportion in Europe. But any who do get into the industry can expect a healthy wage. Boardroom gender inequality has been a big issue in recent years, and although diversity is increasing, there's still a big gap in pay. EasyJet boss Carolyn McCall is one of only a handful of female FTSE100 CEOs. Long thought of as a 'boys' subject, more female students are that realising numbers don't belong to any gender, but the earnings gap is still pretty big for the time being. The study of language is a big earner for women, which probably explains why it has the smallest earnings gap on the list. Like mathematics, physics classes can often seem like a boys' club, but thankfully that's changing. Space agency NASA's employees are almost 50% female. Defined as healthcare work that isn't directly related to nursing or medicine, such as physical therapy or diagnostics, these highly skilled professions will always be solid earners. The strikingly high earnings gap is more likely because of higher-education gender divergences than primary- or secondary-school careers. But it's still surprising given how notoriously demanding the profession is. 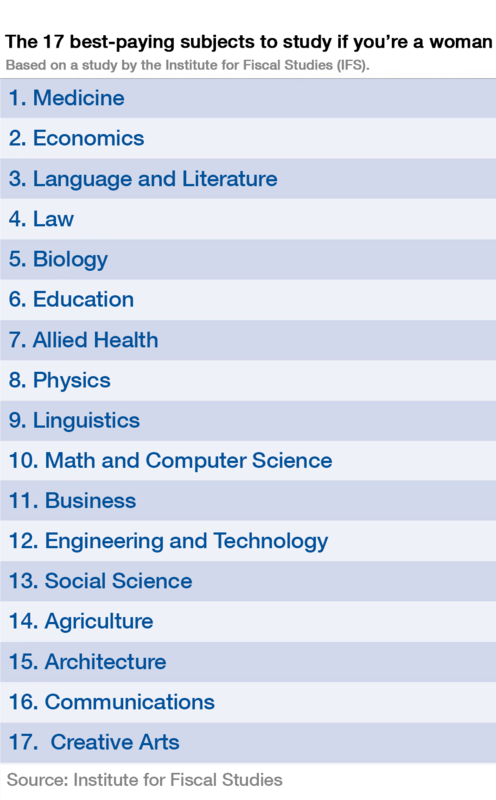 The second-smallest earnings gap on the list is in a science subject, good news for an area where women are hugely underrepresented. As history begins to recognise the impact of more female scientists, perhaps more female students will sign up. Law is a tough profession, but shifting the earnings gap seems even tougher. Nevertheless, it's very well-paid no matter what your gender. Some of the biggest book phenomena of recent times have been written by women, not least the "Harry Potter" series by JK Rowling. Languages are also massively in demand at UK companies, so a degree in that often pays for itself in no time. Some may argue over whether economics is an art or a science, but everyone can agree that a degree in it pays very well. With women like International Monetary Fund head Christine Lagarde (pictured) making waves, it's a lucrative subject for both genders. The best-paying degree for women and men is medicine, perhaps because it usually leads to a very specific, highly skilled, and highly paid profession. While the top 10 female earners who studied economics earned more than those who did medicine, the latter had a higher median average, making it a great subject to study.